The Long Road to China: I Heart Faces - "Best Face Photo From 2011"
I took this photo of Sarah this summer as the girls were playing outside on the back porch. It is by far my favorite close up face photo of her and it just might be one of the best close up shots I have ever taken. and that smile....well, it just lights up the room!! To see more beautiful face photos, click over to I Heart Faces! this is just an amazing photo. beautiful lighting, precious little face, so soft and light! I love this picture of her Lisa:) So beautiful! I love this image of Sarah! Definitely a great entry!! I hope you have a great week, Lisa! Lovely. I think the wisps of her hair really make the image. Her eyes are stunning, and that smile, so sweet! She is beautiful, and I love her eyes! Love the framing of her face and her sweet expression!! Beautiful. I adore this shot- probably even more so now than when I first saw it months ago. 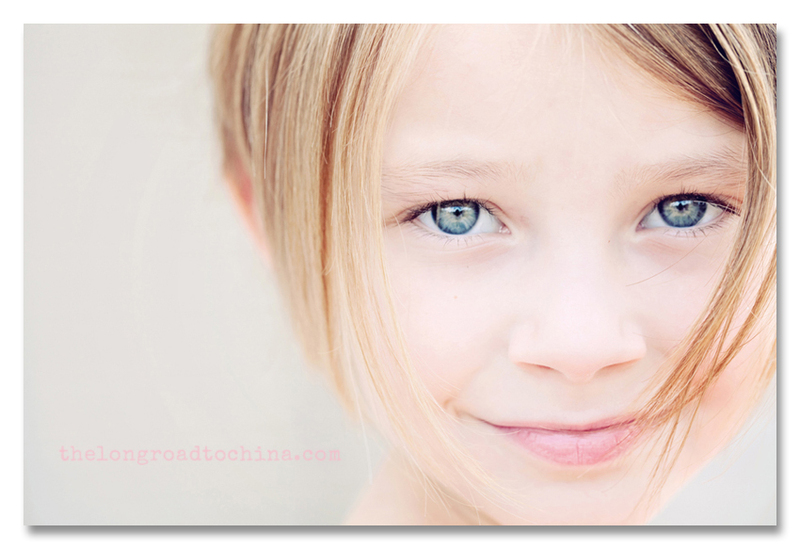 It really is so beautiful & certainly one I think about when I am composing & processing photos of my own girls. Definitely one that has set the standard in my head of where I want to be one day. I loved this picture when I first saw it and love it even more now. You are an exceptional photographer. It is a beautiful photo of a beautiful girl. How are you and your family doing? I hope you are well. So soft and dreamy. You really know how to capture the moment, Lisa. You forgot to mention how beautiful your girl is, but all the previous commenters mentioned it already! All your pictures are stunning, but you knew that too. Absolutely beautiful! I love the fresh simpleness of this photo! Sometimes you just look at your children and get lost in their face and wish that you could just sit and stare forever and never forget how they look at that moment. This is one of those moments captured. What a treasure worth far more than gold! I LOVE this photo of Sarah!! I think you have inspired me again! I have never particiapted in iheartfaces but.... their is a first for everything! This is gorgeous! I love your entry! Cute picture! I especially love her hair in this picture! Wow! This is such a beautiful photo!! I love it!! It's a really beautiful photo, and Sarah is a really beautiful young lady. I noticed how her hair frames her face so well! I love the freshness and simplicity of this photo! Well done! I just think this is the most gorgeous photo!!! Always a fave!! Love the expression! Did it win??? Hope so!